On April 22, 2004 in Karabilah, Iraq, Cpl. Jason Dunham snuffed out a grenade with his helmet and body and, in dying, saved the lives of other Marines. He’s gone now and, like other Marines before him, will never hear the praise for his heroics, wear his Medal of Honor at ceremonies or stand in formation again. 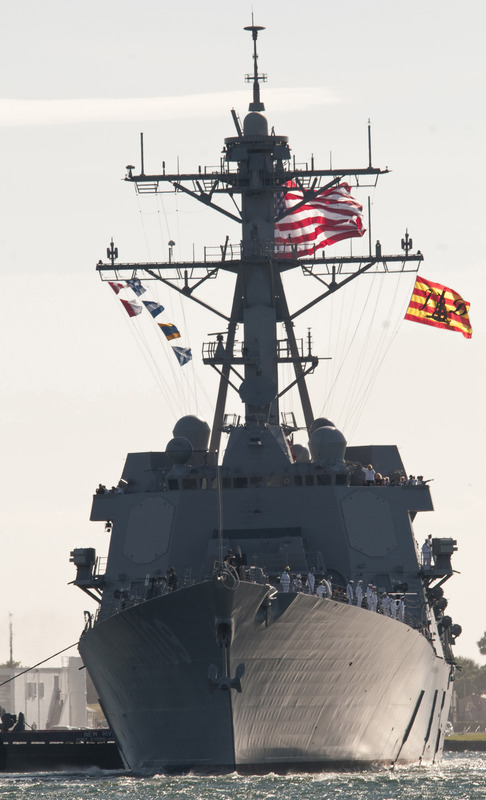 But after Saturday, Nov. 13, when the 9,200-ton, 509-foot warship USS Jason Dunham is commissioned in Fort Lauderdale, Fla., the world will see a guided missile destroyer sail by, proudly bearing his name and cutting through the high seas with a crew of 276. 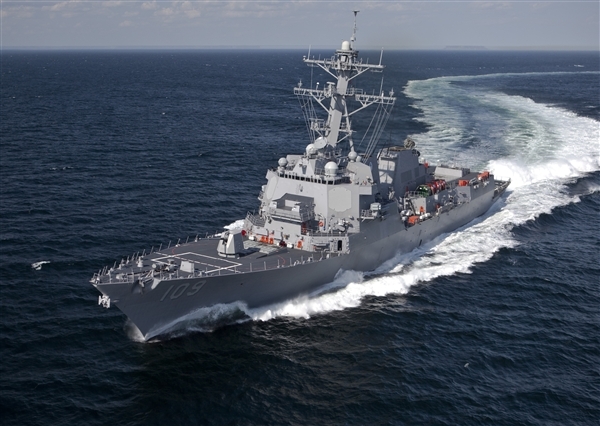 The USS Jason Dunham underway. Photo courtesy General Dynamics Bath Iron Works. His Medal of Honor citation states that Dunham, who was with Company K, 3rd Battalion, 7th Marines, died while leading a rifle squad on a reconnaissance mission. Responding to an ambush on his commander’s convoy, Dunham and his men sped toward the site, came under fire themselves, then hiked on foot where they intercepted a column of Iraqi vehicles leaving the area. Dunham quickly found himself in a hand-to-hand fight with an insurgent who leapt out of one of the cars and when he noticed the man had released a grenade, alerted his fellow Marines before throwing himself onto it. The ship was christened April 1, 2009 at Bath Iron Works in Bath, Maine, and left for its new home in Fort Lauderdale that October. I have chills every time I hear of Jason’s heroism. He knew the consequences of his actions and that he was truly giving his life. I am from Western New York and am so proud of Jason & the family that raised him!!! I cannot stop my tears for his death. bless them all. A true hero! A true marine warrior! How proud, yet heart-broken his family must be. I have no idea what to say in a comment but, felt compelled to write something – America needs to take note of these young heros. I thank you, Jason, for the service you gave our country. God Bless You, Jason’s family, you must also be special to have raised such an outstanding son.